Besides, having a shiny new toy or two just might incentivize you to finally get to work on your decluttering project. Here are some top storage picks from the pros. I'm one of those cooks who saves every scrap of leftovers, no matter how small; so of course I have a million plastic and glass storage containers in my kitchen — and of course I have trouble corralling all those lids and keeping them in order. I was intrigued when I read on the Bneato Bar blog that a paper sorter — normally found in offices — could be helpful the kitchen for keeping container lids accessible and visible in a drawer when placed on its side. I'll try it! Raise your hand if you think we need a gender-neutral term for this incredibly useful device. Maybe I'll just start calling it a Lazy Sam. At any rate, put these rotating trays in your pantry and cabinets. "Instead of letting the oils and vinegars that fall to the back disappear, it keeps everything accessible because it spins!" says professional organizer and blogger Tova Weinstock, aka Tidy Tova. These open-topped, stackable bins with built-in handles by InterDesign are marketed as a bathroom organizer, but founder of Gotham Organizers, Lisa Zaslow, recommends them for every room and closet in the house. "They come in a variety of sizes and make it super easy to group similar things together — one of the golden rules of organizing," Zaslow says. "Because they're sturdy and easy to clean, they're particularly great for things that can spill or are sticky." Weinstock also recommends clear Linus bins, especially for the pantry. "I love these for keeping like-items contained (think: baking supplies) so you know where things are and don't end up buying multiples," Weinstock says. Founder of Chicago-based organizing service Organizing With You, Inc., Pooja Naik recommends a tiered mesh tray for taming desktop clutter by organizing papers that need attention into categories. It may seem obvious, but, she explains, it helps you get that first step of organizing done, clearing the surface, which then gives you more workspace to tackle the next task. With a video-gamer husband and three children who all have their own personal devices, I live in a cable nightmare. Charging cords dangle and sprawl all over my house, making areas that should be calm — like my bedroom — feel chaotic. 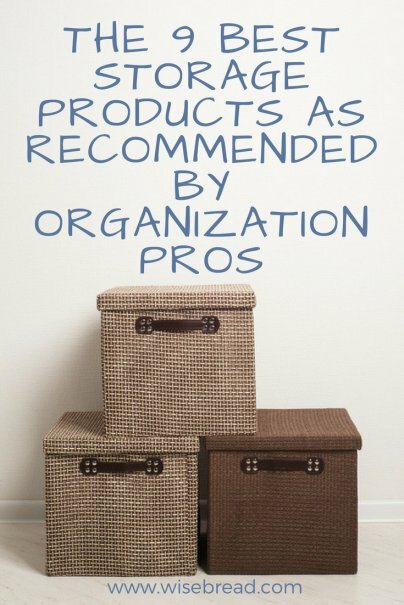 Professional organizer and blogger Cary Prince found a product that just might solve my problem at the National Association of Professional Organizers (NAPO) conference (yes, that's a thing). These zippered cable ties by NEET are like little coats that zip around your cables, from skinny earbud wires to fat bunches of coaxial cables. At home, they can gather together messes of cables and keep them from getting coated with dust. In a purse or suitcase, they provide a convenient way to wrap up and contain cords so they don't get tangled. More than one organizer I spoke with agreed that shoe racks or shelves are a must for preventing pileups. Zaslow swears by this white mesh shoe shelf from The Container Store. "The mesh keeps heels from falling through the shelf, and you can quickly stack them up to store many pairs of shoes in a small 'footprint' — no tools needed. They are super minimal so you barely see them, but they're really strong, unlike some other flimsy shoe shelves," Zaslow says. Lack of adequate hooks for hanging things is often a frustration for me, especially since I'm not handy with a drill. Zaslow solves this problem by using easy-to-apply Command hooks, which come in a variety of sizes. "There endless ways to use them: hang mops and brooms inside of a closet, create a spot for kids' backpacks near the front door, hang your blow dryer on the side of your vanity, or store oven mitts inside the door of a low cabinet near the stove," Zaslow says. Ideally, your kitchen would have shelves at the perfect heights to store all of your dishes and glasses, with no big gaps of wasted space between shelves. But why wait until you have the ideal kitchen before you start organizing, when you can maximize the space in the cupboards you have now? Holland recommends doing that with this DecoBros product, not just inside cupboards but also on countertops. "I prefer these to the white wire ones commonly used as they are more stable and things don't slip through the cracks," Holland writes.